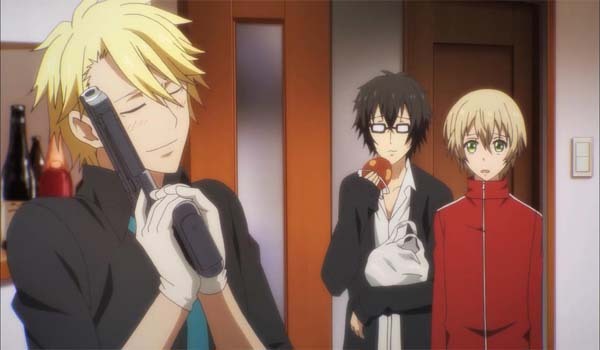 In this episode of Aoharu X Kikanjuu, Hotaru is given some money to buy a new gun. Trouble brews though when Toru meets a personal enemy of his. The previous episode ended with Hotaru reluctantly sticking around to play survival games because of her debt. In this episode, the debt is fully paid and Hotaru is no longer forced to play. In other words, the entire premise of the show is abandoned in pursuit of a new one. Hotaru paying off her tab was the only way romance could blossom, and with that plot device gone, the show is now directionless. This is the feeling you'll get while watching episode 3. 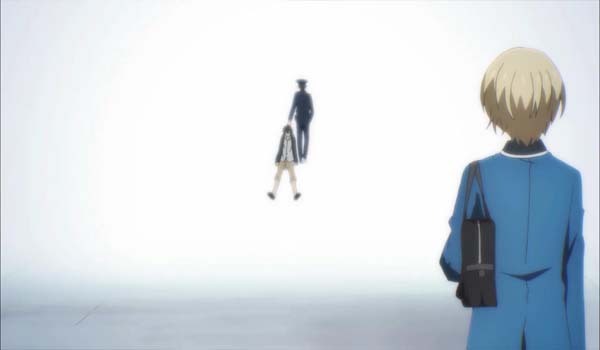 After parting ways with Masamune and Toru, Hotaru decides to continue forward with her ordinary life. The nagging feeling of wanting to play with toy guns is biting at her though. Toru feels the same way, and that's why he decided to visit her in school with an ero-manga in his pocket. He urges Hotaru to come back but she doesn't want to have any part of it anymore. 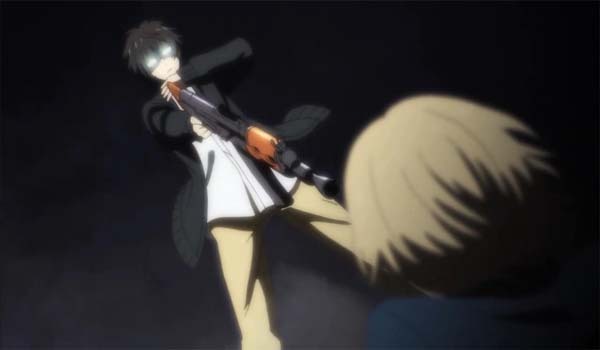 Toru is persistent though even luring Hotaru in with an actual police gun, which causes him to be dragged away by the policeman who owns the gun. With the show suddenly doing a time skip and abandoning the previously established premise, the scenes of Hotaru missing the survival game is a bit forced. Still, the episode tells us that Hotaru is actually in love with the game now. The intense feeling of playing the game is something she badly misses but she is too proud to just walk up to Masamune and ask to join his team again. While deep in thought, she noticed that she received a letter. It's in a black envelope and it's also not addressed to her, but to Toru. He is actually in the same apartment complex as Masamune and Hotaru, which for some reason was only mentioned just now. So Hotaru decides to give the envelope to Toru. She knocks on the door but no one is in. The door was left open though, and Hotaru sees a toy gun on the floor. Fearing someone might step on it, she decides to go inside and put it in a safe place. Toru's room is adorned with guns and Hotaru is overwhelmed. Her feelings of wanting to play intensify as she holds the first gun she ever fired. She's so engrossed she doesn't even notice Toru behind her. She's embarrassed, but it's enough for Toru to know that she wants to play again. Masamune is there too and Hotaru decides to join the group once more. She hands the letter to Toru, as Masamune smiles. "It's that time again" he says as if signaling that something big is about to happen. With Hotaru back in survival gaming, Masamune decides to give her some money to buy her own gun, saying that part of being "the best player in Japan" means having your own trusted partner with you. Masamune has his own and he treats it as his girlfriend. It's something that freaks his teammates out. After that, Hotaru and Toru went to buy her first gun. 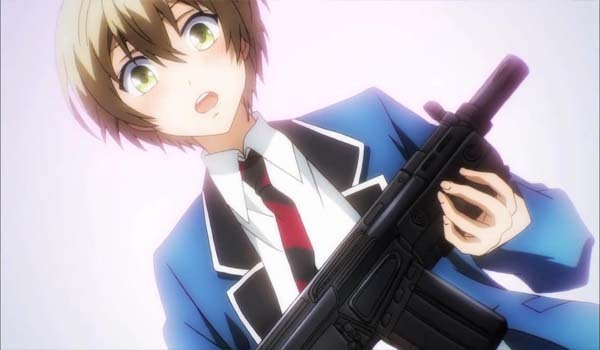 On the way, Toru suddenly sees that an ero-game he wants badly had been released that day, but he can't wait in line because he needs to be with Hotaru to buy her gun. She needs an adult to buy toy guns but Hotaru can see Toru really wants his game. She decided to go on ahead and wait for him there. Inside, she meets an incredibly handsome guy that teaches her how to pick the perfect gun for her. Hotaru is surprised that a nice gentleman like him played survival games as well. The guy is introduced as Nagamasa Midori. After a brief technical rundown of what kind of player Hotaru is, Midori helps her pick her ideal gun. It's love at first sight. On her way to buying the gun though, trouble brews when Toru is not yet around and Masamune only gave her a thousand yen. It's not enough to buy the gun. She remembers though that Toru mentioned she should say "going up" if she's ever in trouble. Upon asking the store manager, she was suddenly asked to go upstairs and test out her preferred gun. It seems that Masamune actually instructed the manager to make sure she buys the gun perfect for her. She goes up and misses Toru entering the store. 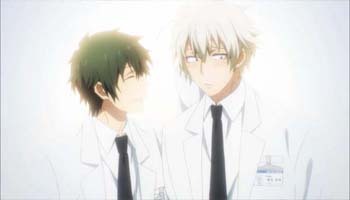 Toru sees Midori though and his eyes suddenly light up. He greets the man with a punch to the face that Midori catches with his hands. 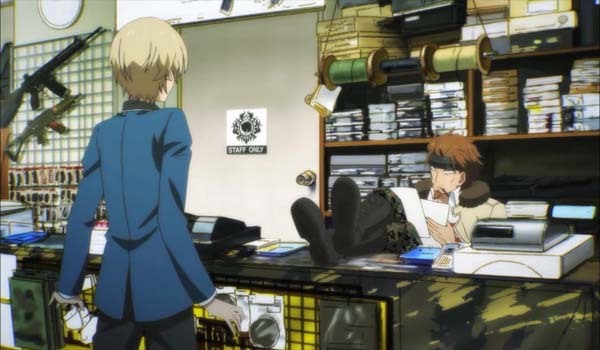 He then twists Toru's arm and pins him to the store counter. His kind face suddenly turned evil as he knows Toru is mad at him for a reason. It seems to be related to the black envelope he received. It turns out that it's an invitation to participate in a tournament. Only the truly talented can join though and the winner gets the title "best in Japan" along with one million yen and other special goodies. It seems Midori is participating as well, making this tournament a bit more interesting to see unfold. ..and this anime is slowly turning weird. Notable moments still belong to Toru though. The guy acts like a kid and seeing him bawl knowing he can't get a first edition eroge game is adorable. He is proving to be a big standout in the show since he provides comic relief and also adds some flare when the show flashes his handsome face from time to time. Since the show did a transition from romance to BL heavy fan service, there are no big moments to really talk about aside from Masamune kissing his gun and hugging it. The moment deserves no words. The confrontation between Midori and Toru is interesting though. Seeing Toru pinned looks pretty great in a different manner. Midori's evil side coming out is also intriguing since it hints at a past incident between the two. 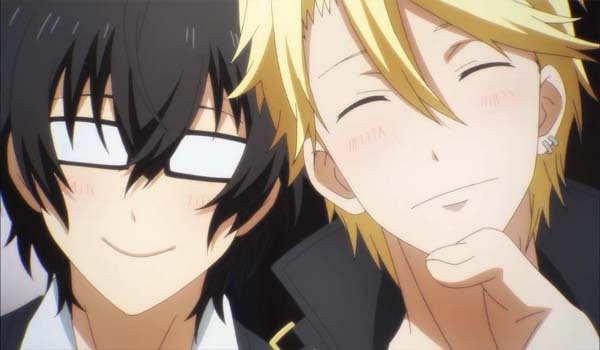 BL would probably develop into a reverse harem element for this anime but it's too soon to tell. For reverse harem to work, the anime will need more hot guys. So far, there are four but only two is interacting with Hotaru as of now. A good reverse harem has five or six guys chasing after the girl so it's up in the air for now. 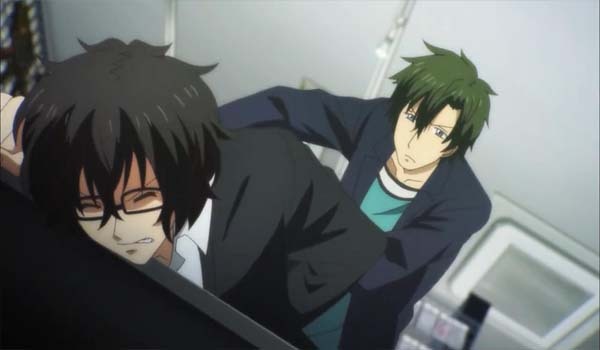 It'll be regrettable though should the BL fan service becomes a mainstay instead. Her teammates still doesn't know that she is a girl. With romance gone, this secret will now only work should the show choose a reverse harem route instead. Some of the guys might use it as leverage to get close to Hotaru and others might become suspicious leading to some interesting development.